In November 2017, when my cousin Alex told me that he recently heard about a new rock band called Greta Van Fleet that sounded like Led Zeppelin, I was pretty sure he had lost his mind. No one sounds like Zeppelin. No one has Robert Plant’s vocal range and no one can play guitar like Jimmy Page. Then I listened to “Safari Song” and realized my cousin was right. Hailing from Frankenmuth, Michigan, Greta Van Fleet is comprised of the three Kiszka brothers, Josh (vocals), Jake (guitar), and Sam (bass), and drummer Danny Wagner. In March 2017, they were signed to Lava Records, which is owned by Universal Music Group, and a month later they released their debut four-song EP Black Smoke Rising. Their band name comes from Gretna Van Fleet, an elderly woman who lives in their hometown. After hearing “Safari Song” I was excited to learn more about the band. When I listened to the first song on the EP, “Highway Tune,” I once again couldn’t believe I was listening to twenty-something kids from a middle state. Soaring vocals, slashing guitars, and music that made me believe in current rock and roll again. I was beyond sold. In fact, for the last eleven months, Greta Van Fleet has been a staple on my radio show. So clearly, when I found out several months ago that the band was on tour with Dorothy (more on them in a minute), I knew we had to be there when they played at the Fillmore Auditorium in Denver. I’m so glad we were. 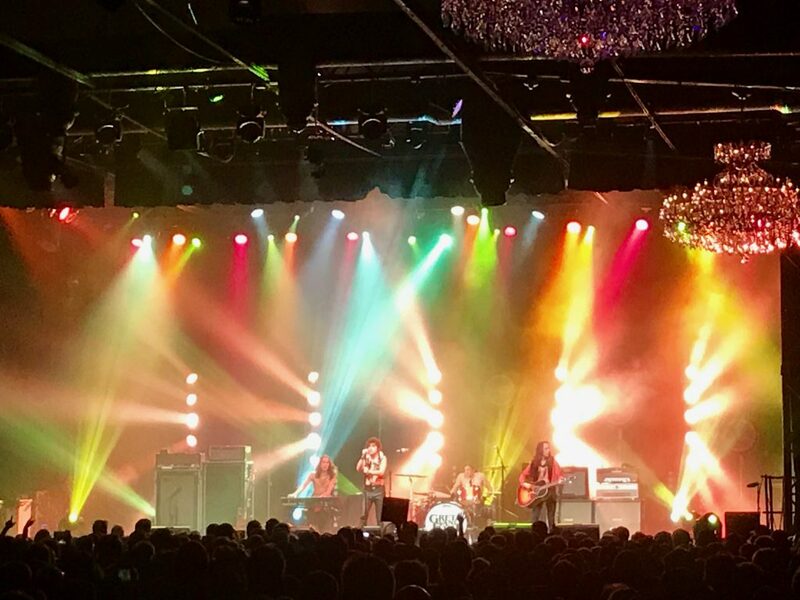 Last night Greta Van Fleet absolutely tore the roof off the 3,000-person capacity Fillmore. They played two-sold out shows (Saturday and Monday) and, after experiencing them live, I can see why they need a night off in between. Their ferocity was incredible and their energy never stopped. Just when I thought Josh’s screeching vocals had peaked he took it an octave higher and then lower and then higher again. But it didn’t stop there – guitarist Jake ripped through a ten-minute solo during their second song and next thing we knew half an hour had gone by. It was one of those solos that reminded the audience why seeing live music matters. He even played half the song with the guitar behind his head. Who does that besides Jimi Hendrix?! Later in the set, the drummer banged out a solo so extraordinary it made me wish John Bonham was alive to hear it. 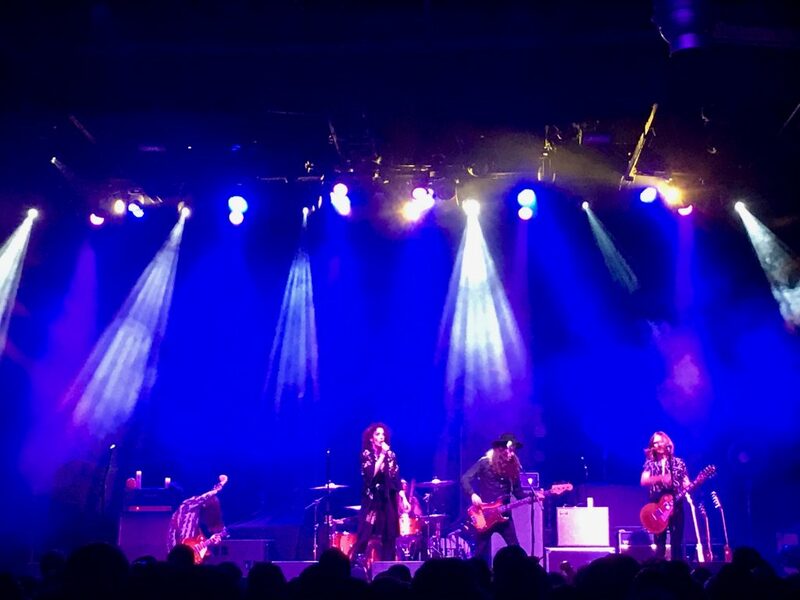 Before Greta Van Fleet wailed through their set, opening act Dorothy kicked off the night with nine songs that reminded the audience why arriving at the Fillmore early is a smart idea. Formed in 2014 in Los Angeles, California, Dorothy consists of singer Dorothy Martin, drummer Jason Ganberg, guitarists Owen Barry and Eli Wulfmeier, and bassist Eliot Lorango. I’m very picky about the female voices I listen to and when I heard Dorothy for the first time I was both excited and shocked to hear her handle those big notes with such a fierce growl. I believed everything she said. Released on June 24, 2016, Rockisdead features so many foot-stomping, snarling blusey rock songs I can’t believe they’re all on one album. “Raise Hell,” “Wicked Ones,” “Gun in My Hand,” “Medicine Man,” “After Midnight,” and “Missile” are so biting there is no question those lyrics are autobiographical. Earlier this year, Dorothy released 28 Days in the Valley which showcases more of Martin’s vocal range than the previous album. Check out “Flawless” and “Freedom” – they are as fantastic as they are authentic. Like the legendary OG girl with a growl, Joan Jett, along with Halestorm’s Lzzy Hale, Martin understands what it’s like to be a female fronting a male rock band and she absolutely owns it. Last night, in an all-black flowing outfit, she channeled her best Jett/Grace Slick by rocking hard but also letting the audience hear the scathingly beauty in her voice. She is a force and, although it was clear that most people at the venue were there to see Greta Van Fleet, she definitely made that audience into fans. Also – all the guys in her band have hair longer than her which is hilarious. Both bands on this tour have lead singers with huge voices, band members that shred their instruments, and a deep love and respect for rock and roll and blues. My favorite. Greta Van Fleet is such a solid band they are on tour supporting two tiny EPs. Their debut full studio album, Anthem of the Peaceful Army, is slated for release on October 19. If the two songs I’ve heard already, “When the Curtain Falls” (played live last night) and “Lover, Leaver,” are any indication, it’s going to be one hell of a record. As predicted, Greta Van Fleet playing two nights at the legendary 3,000-person capacity venue was a moment in time. They are on the verge of becoming one of the biggest rock and roll bands in America. You heard it here first. Next time Greta Van Fleet and/or Dorothy roll into your town, get a ticket and go. It will be one of those situations where in ten years you’ll tell people you saw them at a tiny venue and blow their collective minds.